Yesterday we broached the outer edges of what Environmentality was, and how Disney defines Environmentality through its Environmental Policy. Though the policy covers plenty of environmentally friendly endeavors, the very mechanical language can leave a reader scratching their heads. Today, we will take a look at several examples of how the Walt Disney Company walks the walk it talks. Water and Energy: Over twenty-five percent of all water used at Walt Disney World Resort is reclaimed water. Over five million gallons of reclaimed water are used daily landscape irrigation, vehicle washing, street and sidewalk cleaning, cooling tower makeup, fire suppression and protection, and construction activities. Environmental Impact: Since their installation in December 2007, the solar panels at the Walt Disney Studios have generated 221,317 watthours. Conservation: The Disney Worldwide Conservation Fund has sponsored over five-hundred and forty projects since its inception in 1995. An example of one such program is the Rhino Security Team project, which is itself a part of the Lewa Wildlife Conservancy. 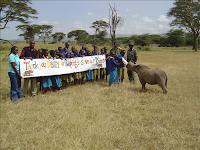 DWCF’s contributions will allow for the continued security of both black and white rhino in Kenya. Education: In 2007, Disney’s internal portal for employees, The HUB, began hosting environmental resources for employees including an A to Z recycling guide. Research and Technology: Another program that benefits from the funding of the DWCF conducts aerial surveys of elephants in Northern Botswana to determine the seasonal distribution, abundance, and habitat use. Information gathered in these surveys will be used to assess human and elephant conflicts. Accountability and Evaluation: In 2008, Disney unveiled The Green Standard to reduce the company’s impact on the environment. With simple language and ideas, the goal of The Green Standard outlines behaviors to improve workspaces, meetings, events, travel, and dining. Waste Minimization: In 2005, ABC recycled more than seven-hundred and sixty-three tons of paper. Laws and Regulations: According to the EPA the Walt Disney Company as reduced the equivalent of 71,000 plus metric tons of carbon dioxide, according to figures TWDC released in 2005 relating to recycling and waste prevention. Cooperation: Just announced on Monday, 7 July 2008, Walt Disney Studios Home Entertainment publicized plans to work in partnership with the Advertising Council, the National Marine Sanctuary Foundation (NMSF), the National Oceanic and Atmospheric Administration (NOAA), the U.S. Department of Interior to raise public awareness of the health of the oceans through Public Service Announcements. Fantastic, Ryan. These posts - yesterday's and today's - are so interesting and fascinating. Thank you for them - and I definitely think it's important to understand how Disney as a company are helping the environment. And I bet a heck of a lot of work went into these posts - thank you again!